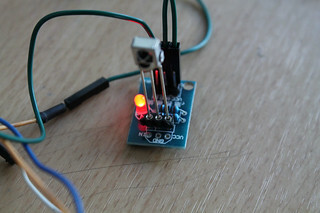 See the following image to know how to fix the infrared sensor on the breakout board. Use the three dupont wires to connect the breakout board to your Arduino. And a connect an LED to digital pin no. 13. As you press a remote control directing to the Infrared sensor, the LED will be switched on and off. Easy steps for making a line following robot using Infrared LED, Photodiode, Ardumoto and Arduino.